Hiya Geeklings! Hope everyone’s staying dry. I got something fun for you this week. One of my favorite YouTube fandom parody musical teams, The Hillywood Show (I’ve mentioned them before), released a new video this week. I’m super stoked not just for the new vid but also because it looks like the Hillywood duo is coming to Fan Expo this year *squeal* For their latest project they decided to revisit Supernatural, except this time we’re getting retro and busting some ghosts. It’s the mashup we didn’t know we needed but I’m so glad it exists. One thing I love about Hillywood’s Supernatural videos is that the actors from Supernatural are totally willing to get involved as well. Go ahead, count ’em, there’s so many! And be sure to take a look at their last Hunting video. That’s all for now Geeklings. Get ready for Vaughan Fan Con coming in just over a month. It’s the last week of the Teen Challenge so keep up the awesome work and don’t forget to sign up for the End of Summer Party happening this Saturday night at Pierre Berton. Have an awesome week and until next time, End of Line. Week of Geek: Can you be a fan of something if you haven’t seen/read it? Ooooooooooh… tough question. And not one easily answered. 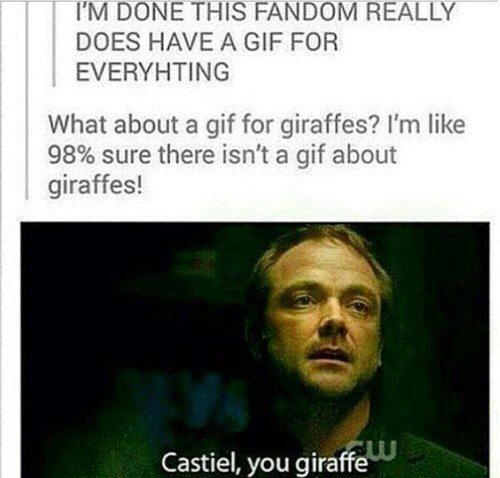 It was Supernatural that made me ponder this puzzlement recently, the show that has a gif for everything. This week they’ll air what you call a ‘backdoor pilot‘ (find some examples here) in order to introduce their new spin off series Wayward Sisters, a female-driven monster hunting show *squeal*! I am excited by this news, and I consider myself a Hunter (a Supernatural fan; there might be other names for them). But then… I remembered that I really haven’t seen much of it. It’s currently airing it’s 13th season and I stopped regularly watching around season 4. There is almost a decade worth of episodes I haven’t seen, just the odd ep here and there. So… am I still in the club? And it’s not just with Supernatural either. 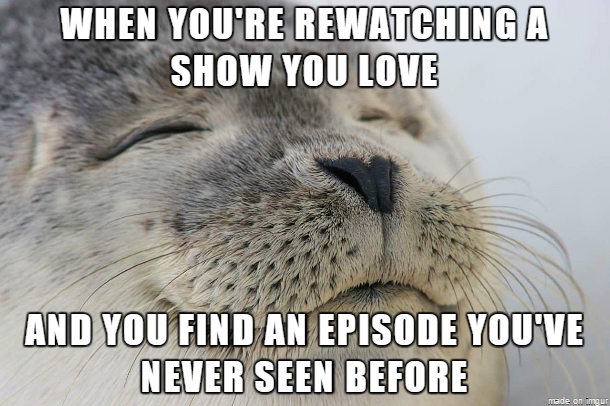 It’s the same situation with a lot of shows. Or books. Or film series. Many things started, but not finished… or not even started yet. Still, all of these shows or books or movies are ones I build Pinterest boards around and find wallpaper for my computers and wear the jewelry and the tshirts. Does the fact that I’ve even seen them at all make me a fan? A true fan? Does looking for pics and memes on Pinterest mean I’m still a fan? Some fans would say no. There are fans out there who are VERY protective of their fandoms. Ones who have seen every episode or read every book ad infinitum. And there are some fans who feel that doing that gives them dominion over a fandom. That they’re the true fans, the ones who really know the show or the character or the book, and everyone else are just posers or ‘Fake Fans’. But here’s what might be a more important question than the ones I asked above; Am I thinking WAY too hard about this and should just enjoy a franchise however I want? I think we all know the answer to that. The fact of the matter is that there is NO SUCH THING as a fake fan. I mean really, no one has dominion over how much you love something. You found something you like, and it should be up to you to like it however you want. Go forth and be plentiful! There, question answered. But if you do want to read or watch something, you know where to find us. I’ll be off next week Geeklings, so have a great week, see you soon, and until next time, End of Line.